I have only visited Canada twice - a couple of days at Niagara Falls and about ten days working in Vancouver in February 2010. The Vancouver visit should have been longer but for an unfortunate stumble which resulted in a severely broken arm and an immediate flight home for surgery! 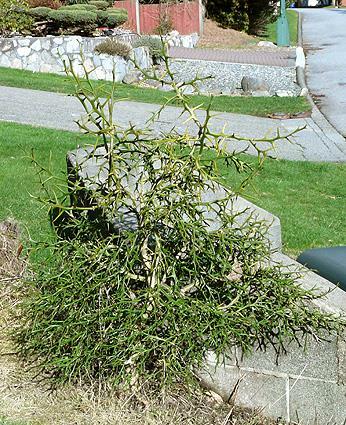 I believe the climate of coastal British Columbia is mild enough to allow Poncirus trifoliata to thrive. It is hardy down to at least -15C, probably -20C. The lowest temperature ever recorded in Vancouver being -17C. 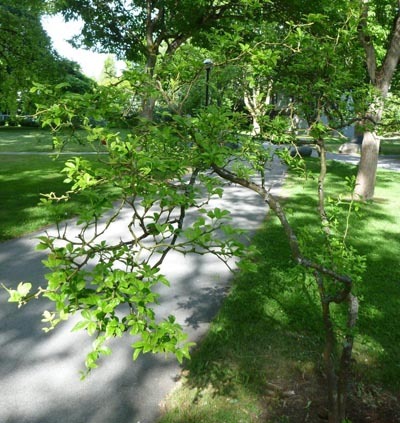 In spite of hunting through the botanic gardens at the University of British Columbia, including the japanese Nitobe Memorial Garden, and the VanDusen botanical garden, I found no trace of any Poncirus trifoliata specimens. 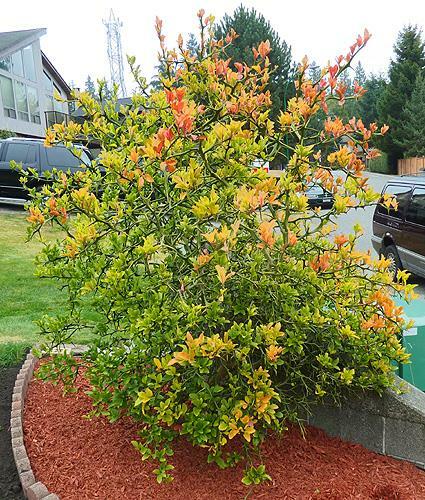 However, I was shown one plant in the front garden of a private house in North Vancouver - the owner also having a potted citrus collection with Meyers Lemons growing outside protected just by a small plastic enclosure. (Click here for photos of these Canadian lemons.) The unprotected Poncirus looked perfectly healthy, although still only a few feet tall. Although so far without fruits, it has produced a few spring flowers. No doubt fruits will mature in the next few years. 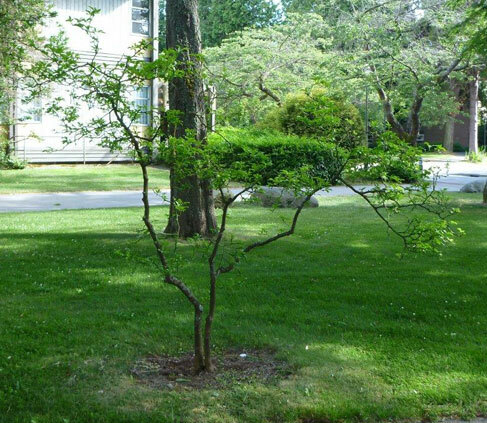 From studying the buildings in the photo, I located this plant, but it is not quite in the same position as shown in the original map of campus plantings . It seems to be in the position of 59, rather than 82. The original 1980 planting at 59 was Gleditsia triacanthos, which I hope looks sufficiently different from Poncirus trifoliata not to have been confused. 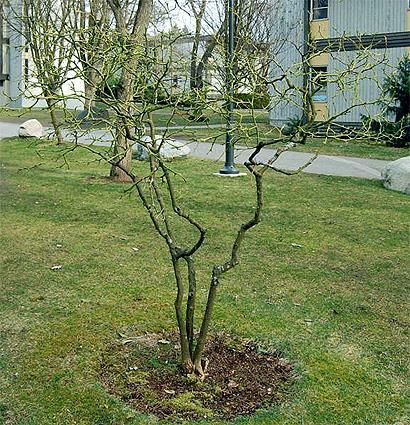 After returning from Vancouver, I came across a photo on the web showing a small tree on the University of British Columbia campus - I must have unknowingly passed within a few minutes walk! 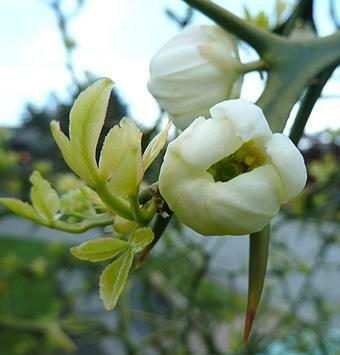 GoogleMaps Street View currently (December 2014) just about shows this Poncirus trifoliata. It is the small shrub leaning over the path at the bottom left of the pedestrian sign. I was sent further photos of this plant taken in summer 2013. 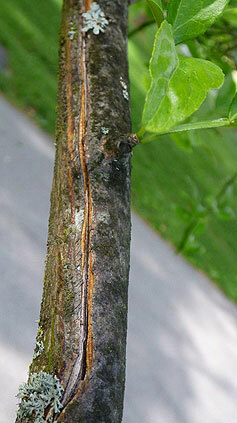 It appears to have lost one of its three original stems, has some decay to other branches and appears to be much the same size as several years before. This shady spot is probably not the ideal position, but it does confirm the species survives in this part of Canada.